Impeccable!!! I wish I could sew 4 of anything in the amount of time you sew 4 shirts. Pam, you rock! I love the "limp dishcloth" look of linen. I think it is just gorgeous and this striped shirt is wonderful. Oh, I just LOVE that blue batik! They are both beautiful, but that is beyond. Oh Pam, as usual you AMAZE me and the shirts are fabulous! Beautiful! Lovely! and wow, you are a wonderwoman! Do you put the crispy fusible on both upper and under collars? Your shirts look wonderful. Hi Marie...and thanks for your nice comment. When making a standard "dress shirt" with a collar and stand, yes, both upper and under collar + stands are interfaced with "Shirt Crisp". 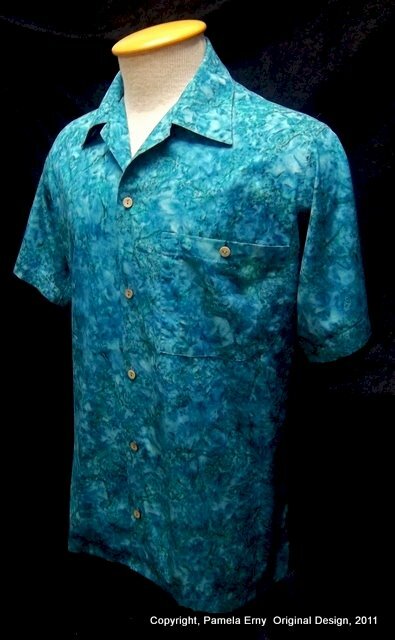 On more casual shirts, like the blue batik shirt shown here, I just interface the under-collar and front facings with "Shirt Crisp", OR if the fabric is very soft and I want to preserve that hand, I fuse both collar layers and facings with "Pro-Sheer Elegance". It all depends on the fabric..it's always a good idea to make a "fabric and interfacing sandwich" ...a test swatch to see if you like the hand (feel) of the result on the particular fabric you plan to use. Very nice shirts. I recently picked up a pattern to make casual shirts like your blue one for my hubby. Sometimes I just don't like the way casual shirts fit his neck. I was shopping at a resort boutique this morning, and was just dismayed at the quality of shirts for the $$ price tag. Time to whip some up! Oh Pamela! it's a awesome creation. The first shirt can be used as a dress shirts as it looks professionally perfect. The blue one is tremendous and i like the two things about this shirts that you have use a button in the middle of the pocket and the collar size is perfect. Great job Pam. Lovely work as usual Pam, it is so good to see you posting & working again. I hope this means you are feeling great!